Bicycle helmets are best suited for us e-scooterists. This article will help you decide what to get (skip the road bike helmet portion). 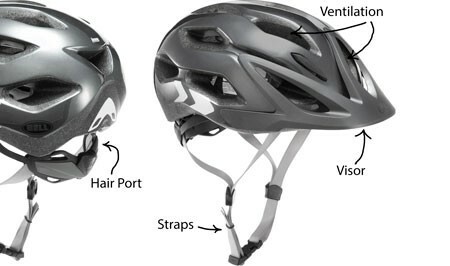 A comprehensive guide on helmet design standards and usage can be found at the US Consumer Product Safety Commision page. Few people would choose to ride in a car with no seat belts. So why hop on a scooter without a helmet? Helmets simply make sense in all riding conditions regardless of whether they are required by law or not. Test results have helped manufacturers create helmets that are light, comfortable and able to handle significant impacts. Here are some tips for choosing a bike helmet model that is well-suited to your needs. Most helmets use in-mold construction, a popular process that fuses an outer shell and inner liner without the use of glues. This results in light-yet-strong designs. Shell: Most cycling helmets are covered with a plastic shell to hold the helmet together in a crash, provide puncture-resistance and allow the helmet to slide on impact (to protect your head and neck). Liner: Most helmet liners are made of expanded polystyrene foam. On impact, the liner dissipates the force to protect your head. Make sure the liner fits your head comfortably. Some helmets feature Multi-directional Impact Protection System (MIPS) technology, a way of constructing helmets that’s aimed at providing more protection from rotational forces during a bike crash. MIPS-equipped helmets feature a low-friction layer that allows the helmet's impact-absorbing foam liner to rotate slightly around your head during an impact. It moves only a few millimeters overall, but it can reduce the amount of rotational force that may be transferred to your brain in certain impacts. Visor: Some riders prefer having a sun-shielding visor attached to the helmet. These are very common on mountain bike helmets. A visor does, however, add a fractional ounce of weight and slight wind resistance. Full-face protection: Some mountain bike helmets have a wraparound chin bar to provide face protection for downhill mountain biking and park riding. Some enduro racers also like the added protection. When choosing a bike helmet, a good fit is vital. Most helmets come in small, medium, large or extended sizes. To find your size, wrap a flexible tape measure around the largest portion of your head—about 1 in. above your eyebrows. Or, wrap a string or ribbon around your head, then measure the length of string with a straight-edge ruler or yardstick. Look for a helmet size that matches your measurement. On REI.com, the size range is listed under the "Specs" tab on each product page. Between sizes? Either opt for the smaller size or wear a cycling cap or beanie to improve the fit of the larger helmet. Some adults with smaller heads can wear a kids' size comfortably. A good-fitting helmet should be snug but not annoyingly tight. It should sit level on your head (not tilted back) with the front edge 1 in. or less above your eyebrows so that your forehead is protected. Push the helmet from side to side and back to front. If it shifts noticeably (1 in. or more), you need to adjust the fit. To adjust the fit, first expand the sizing wheel before you place a helmet on your head. Almost all helmets have a sizing wheel on the back of the helmet's internal sizing ring. Once the helmet is in place, reach behind your head and tighten the ring (usually by twisting a wheel) until you get a snug fit. Next, buckle and tighten the chinstrap. The straps should form a "V" as they rest under each ear. Adjust the straps around both ears until you have a comfortable fit. Finally, with the chinstrap buckled, open your mouth wide. The helmet should press against the top of your head as you do so. If not, tighten further and repeat. Just don't over-tighten the strap until it's uncomfortable. Avoid using chemical solvents to clean a helmet. Manufacturers recommend only the use of a soft cloth or sponge, plus mild soap and water. Removal pads may be washed. Do not store a helmet in an attic, garage, car trunk or other area where heat can accumulate. Excessive heat may cause bubbles to form on helmet parts. Do not wear a heat-damaged helmet. Avoid loaning your helmet to others. You want to know exactly what kind of use your helmet has experienced during its lifespan. Any helmet involved in an accident is likely to get damaged. Replace the helmet after any significant impact, even if everything looks OK. If you've been crash-free, it is generally recommended to replace your helmet after 5 years. Pollution, UV light and weathering can weaken its components over time.